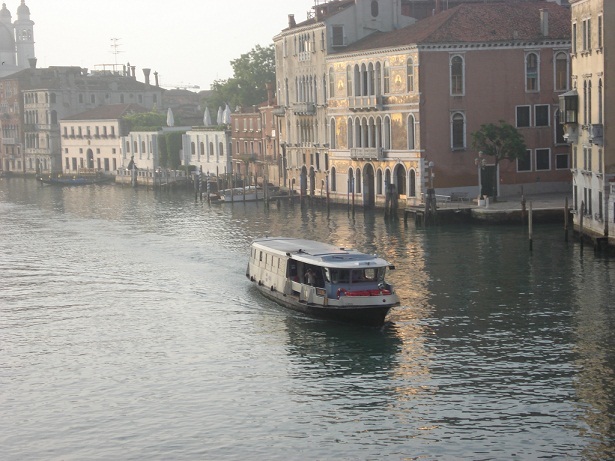 I love early mornings in Venice, and I love the serenity and stateliness of the vaporetto chugging its way up the Grand Canal in the morning light. I took this photo standing on the Accademia bridge in 2007, and looking at it, I remember the familiar, solid, smooth feel of the balustrade of the bridge as I leaned over it, and the quiet of the morning. Whenever I stand on the bridge, I am always looking for the Salute and the Peggy Guggenheim Collection. Looking at this photograph again, I noticed for the first time that you can see mosaics glinting in the sun. I went to my trusty guide, The Grand Canal (Umberto Franzoi) and discovered that the mosaics belong to the Palazzo Barbarigo, originally a 16th century building that stands alongside Campo San Vio in Dorsoduro. The palazzo was headquarters for Pauly & C, Compagnia Venezia Murano, which was founded in 1866. The mosaics were applied by Giulio Carlini (1830-37), and reference the Basilica.